All transactions are safe and secure with a reliable history in online purchasing behind each of our associates. Buy the Lucy What Have You Done t-shirt to own I Love Lucy clothing and merchandise. Unfortunately for Ricky Ricardo, he can't always have his eye on his wife. Lucy's shenanigans often make a mess that Ricky is left to tend to. "Lucy, what have you done?" can be heard around the block nearly every evening. 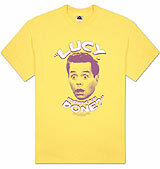 This Ricky Ricardo t-shirt shows his look of surprise at each new scheme his wife conjures up. Wear it next to your wife's Lucy Chocolate Factory costume today. In addition to the Lucy What Have You Done tee above, browse the I Love Lucy Clothing Gallery for more apparel like men's and women's clothes, kids shirts or hoodies.